This movie was big among some of my friends when I was graduating high school.Â I never really understood it.Â I was big on Paul Thomas Anderson and the LOTR movies and Quentin Tarantino and all one group of my pals wanted to do was watch this Disney movie every time we got together.Â It was a decent movie, but itâ€™s a strange way to spend a Friday night when youâ€™ve just turned 18.Â Nonetheless, now thereâ€™s a special edition of that same movie on DVD and itâ€™s available right now! Starting this March 24th, now available in a two disc special edition from Walt Disney Studios Home Entertainment comes the expanded adventures of a little girl and her strange genetic experiment pet and the real definition of family.Â Lilo & Stitch â€“ 2-Disc Big Wave Edition is ready to splash right out of your television screen and flood your living room with a great adventure and plenty of important life lessons. Lilo is a young and precocious Hawaiian girl who lives with her older sister after their mother has died.Â She ends up adopting a puppy named Stitch.Â The only problem is that Stitch isnâ€™t a dog at all, heâ€™s an alien genetic experiment which has escaped and is now proceeding to wreak havoc all over the Hawaiian Islands.Â His real owners come for him and things arenâ€™t looking too pretty as both Lilo and Stitch have to do their best to escape and stay safe.Â Along the way, Stitch learns a valuable lesson about â€˜ohana, the Hawaiian concept of family which Lilo is glad to teach him. The special features included in this two disc special edition are five deleted scenes, two early versions of scenes, an interactive behind the scenes look at the making of this movie, an optional audio commentary from directors Chris Sanders and Dean DeBlois, a music video with the Hawaiian Chorus, a music video by the A-Teens of â€œI Canâ€™t Help Falling In Love With You,â€ some great island adventure games, a look at Stitch through the years of Disney and an in-depth look at the Hawaiian Islands. This movie has always been a great one and with the addition of a whole disc of bonus materials, this is now a fantastic cinematic adventure.Â There are very special lessons being taught in this movie, some of the most serious and basic of all of them which are often taught in Disney movies.Â The idea of â€˜ohana is a very good one and something we could all us a little more of.Â Also, the animation in this movie is a delight, especially when it comes to Stitch.Â Never before has a potentially dangerous and frightening alien ever seemed so inviting.Â That is one of the great triumphs of this movie.Â In watching it again, I was struck by how frightening some of the chase and fighting scenes would be to a young child.Â So keep that in mind, but Iâ€™m sure you children will greatly enjoy this modern classic. Catch this Big release today! This two disc Big Wave Edition is available at Amazon.com. 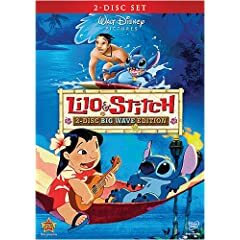 No user commented in " Movie Review: Lilo & Stitch â€“ 2-Disc Big Wave Edition "